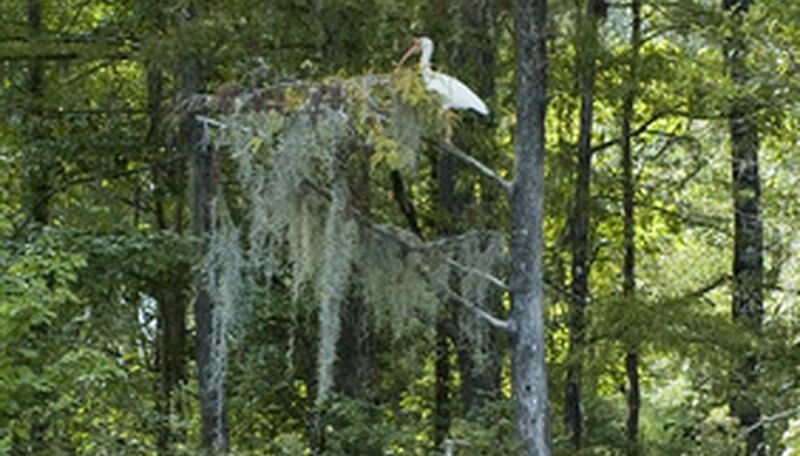 Although many people who see Spanish moss in a tree think it is a parasite, it is actually a bromeliad that does not harm the tree directly. What little damage Spanish moss inflicts on a tree occurs when heavy infestations shade the tree. Although most university agricultural centers do not approve the use of sprays to kill Spanish moss, a few sprays are effective in killing Spanish moss while not harming trees. Copper-based chemicals should be treated as an herbicide rather than as a mineral. Copper sulfate is often marketed as bluestone. You can purchase copper sulfate sprays that are premixed, or mix your own. One good mixture, which is known as the Bordeaux mixture, combines copper sulfate, lime and water in a ratio of one part copper sulfate and one part lime to 10 parts water. Do not apply copper sulfate to trees in spring when new leaves and buds appear on the branches. During this time the chemical can kill the new growth. Potassium salt of fatty acids is made from naturally occurring, biodegradable fatty acids. The spray is used to kill many types of moss including Spanish moss, as well as for killing moss on decks or rooftops. The chemical may be used around home areas because it is nonstaining and will not harm other plant varieties. It contains no zinc or iron and is noncorrosive to metals. Sprays containing potassium salt of fatty acids are toxic to aquatic invertebrates. Zinc is a metal that will kill any moss that tries to grow near it. For this reason, roof flashing and metal hardware around skylights are often treated with zinc. Zinc-based sprays will kill moss without harming trees. Zinc comes in many forms, including zinc sulfate and zinc chloride as well as a zinc-copper sulfate mix. Zinc sulfate may be applied to Spanish moss in a concentrated powder form. Zinc chloride in a 13 percent concentration powder may be applied directly to moss as well. Zinc chloride in a 62 percent concentration must be mixed with water at a rate of 1 pint zinc chloride to 3 gallons water.